Baby FTP Server is a basic FTP server that allows only anonymous access. It supports most RFC959 FTP commands, as well as PASV and non-PASV mode. You can configure the home directory and set permissions for download/upload/rename/delete/create directory. Writes settings to: Windows registry. But given the nature of the application and the small number of options that it exposes, I am accepting it as portable. How to extract: Download the ZIP package and extract to a folder of your choice. Launch babyftp.exe. marcoc, not ftp, web based only. Although a great program to transfer a few files over the network, this program failed when transferring very large (over a gig) files over a network. I recommend instead Filezilla Server included in XAMPP (http://www.portablefreeware.com/index.php?id=1069. TYPSoft FTP Server is a fast and simply ftp server with support to for virtual file system, download/upload resume, IP restriction and access logs. How to extract: Download the ZIP package and extract to a folder of your choice. Launch ftpserv.exe. 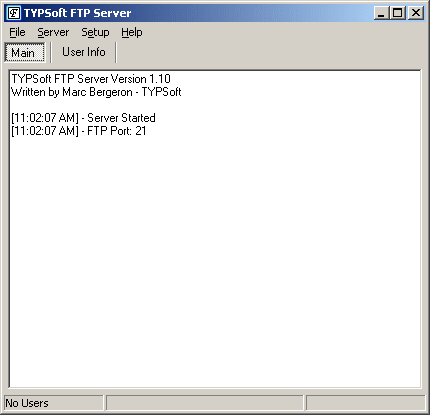 In fact, as a long-time user of TypSoft FTP server for quick temporary transferts, I reverted to version 1.00 because 1.10 and the short lived 1.11 patch ( TypSoft site was hijacked shortly after its release ) had problems if you did not have a genuine FTP client for browsing, while 1.00 still allows explorers and firefoxes as clients.